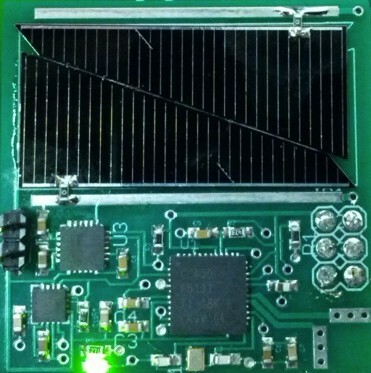 KickSat-1 is an amateur radio CubeSat technology demonstration mission designed to demonstrate the deployment and operation of 128 prototype Sprites (also referred to as ChipSats or femtosatellites) which were developed by radio amateur Zac Manchester KD2BHC at Cornell University. 315 individual sponsors donated $74,586 to the project through the crowd-source funding website Kickstarter. KickSat-1 is planned to launch on ELaNa-5 / CRS-3 from Cape Canaveral in early 2014 into a 325 x 315 km 51.5 degree inclination orbit. The CubeSat will operate on 2401.2-2436.2 MHz and when deployed all the 128 Sprites will operate on a single frequency 437.240 MHz and use CDMA. 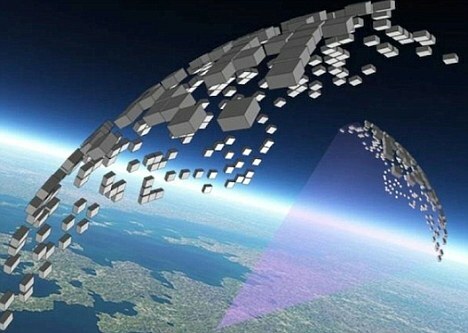 It is believed this will be the largest ever single deployment of satellites. It the UK both the British Interplanetary Society (BIS) and London Hackspace are developing Sprites for this mission. ChipSats like the Sprite represent a disruptive new space technology that will both open space access to hobbyists and students and enable new types of science missions. The Sprite is a tiny spacecraft that includes power, sensor, and communication systems on a printed circuit board measuring 3.5 by 3.5 cm with a thickness of 2.5 mm and a mass of about 5 grams. It is intended as a general-purpose sensor platform for micro-electro-mechanical (MEMS) or other chip-scale sensors with the ability to downlink data to ground stations from LEO. 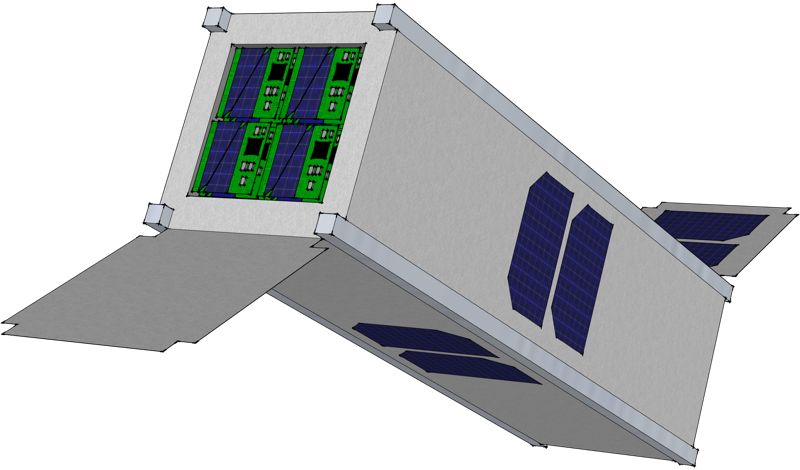 KickSat is a 3U CubeSat being built to carry and deploy the Sprites. A 1U avionics bus will provide power, communications, and command and data handling functions. A 2U deployer has been developed to house the Sprites. Approximately 128 will be stacked atop a spring-loaded pusher and secured by a nichrome burn wire system. After being released from the P-POD, KickSat will perform a de-tumble maneuver and establish communication with Cornell’s ground station. After check-out, the spacecraft will be put in a sun-pointing attitude and spun up to maintain that attitude. A command signal from the ground station will then trigger the deployment and the Sprites will be released as free-flying spacecraft. After deployment, telemetry and sensor measurements from the individual Sprites will be received through Cornell’s amateur radio satellite ground station in Ithaca, NY, as well as several other amateur radio ground stations throughout the world. The Sprites are expected to reenter the atmosphere and burn up within a few days or weeks depending on atmospheric conditions. The maximum orbital lifetime is estimated at 6 weeks. KickSat Downlink Frequency: 2401.2-2436.2 MHz RF Output Power: 1W ITU Emission Designator: 350KF1D Description: AX.25 over FSK. Sprite Frequency Band: 437.240 MHz. Output Power: 10 mW ITU Emission Designator: 50K0G1D. Description: MSK modulated binary data with each data bit modulated as a 511 bit PRN sequence. All Sprites operate on a single frequency and use CDMA. Zac Manchester KD2BHC has said they are aiming for the Sprites to be receivable using an AMSAT-UK FUNcube Dongle SDR. As well as KickSat-1 several other amateur radio CubeSats are being launched from Cape Canaveral in early 2014 on ELaNa-5 / CRS-3 into a 325 x 315km 51.5 degree inclination orbit. They are: DragonSat-1 – USNA and Drexel University, Trailblazer – University of New Mexico, PrintSat – Montana State University, All-Star/THEIA – University of Colorado, UNP-6 Radar Calibration CubeSat – University of Hawaii, PhoneSat – NASA ARC, MisST – NASA ARC. On September 10, the “MENTOR Makerspace” program kicked off with a special event held at the College of San Mateo. The MENTOR Makerspace program has a goal of introducing low-cost makerspaces into 1,000 high schools over the next three years. NASA’s Matthew Reyes attended the event and in this interview with Tony Wan he explains how students from San Jose State University went from tinkering in their local TechShop to exploring the final frontier. 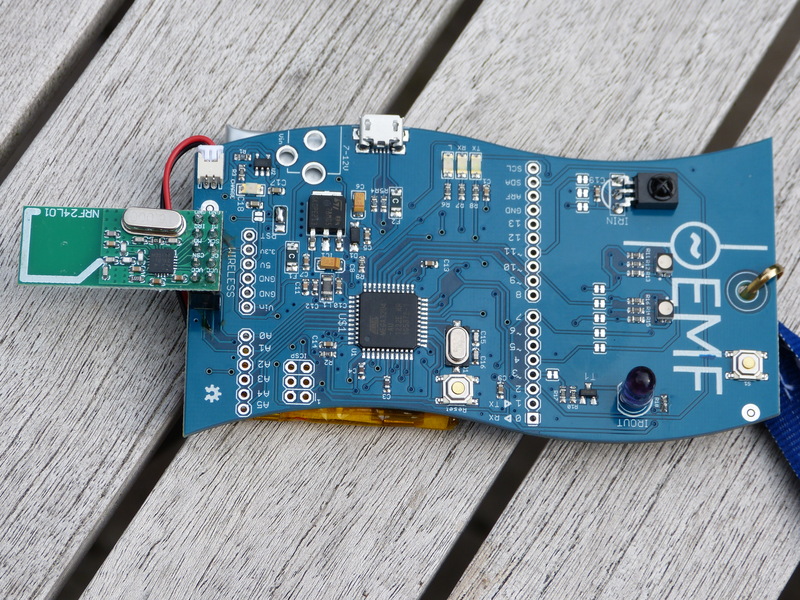 The technology camp EMF 2012 being held at Pineham Park, Milton Keynes runs from Friday August 31 to Sunday, September 2. BBC TV reports that two 20m high masts linked by microwaves have been erected for the event, one at the campsite and the other in the car park of a data centre 2.5 km away. Among the weekend of presentations are some by radio amateurs such as Adam Greig M0RND (formerly M6AGG). Adam is a member of the UK High Altitude Society (UKHAS) and Cambridge University Space Flight (CUSF) and will be talking about High Altitude Ballooning. The balloons use 434 MHz for the telemetry and video image downlinks. The Google Lunar X-Prize team Part-Time Scientists delivered a presentation Not your Grandfathers moon landing at the Chaos Communication Congress. Hell yeah, it’s Rocket Science 3.1415926535897932384626! The basics, we are team of part-time scientists and engineers who want to send a rover to the moon before the end of the year 2013. There is a lot to be done towards this first private moon landing and we want to take the chance to explore what we want to do and show what we already accomplished in the past 12 months. The talk will feature important technical milestone like our very first R3 rover prototype and great events like the CCCamp11. There is also be a live demonstration of the very first R3A rover right in the presentation. We want to take this chance to present where we are and what is next to go on the worlds first private mission to the moon. 2011 was great and we want to show you some of our personal highlights like us actually doing real rocket science at the CCCamp11. We will have a close look at the first R3 Rover prototype how it got made and all the cool things we already did with it and going to test along the next year. We’re aiming for a pretty quick and dense 30 minute review of 2011 with an outlook for 2012 and then do a live presentation of the R3 rover with an open Q&A round. This time we split our efforts and got our most interesting presenters to enroll for separate talks on one self picked exciting topic they worked on this year in their own free time. Electromagnetic Interference (EMI) issues the team encountered are discussed at 19:15 into the video. Even after years of committee review, communication protocols can certainly be hacked, sometimes highly entertainingly. What about creating a protocol the opposite way? Start with all the hacks that can be done and search for a protocol that gets around them all. Is it even possible? Part-Time Scientists has used a GPU to help design our moon mission protocols and we’ll show you the what and how. Danger: Real code will be shown!